Strictly Private & Confidential HIGH YIELD EQUITY-LINKED INVESTMENT (HY ELI) Grow Your Investments for Higher Returns Arranger Calculation Agent Manager. 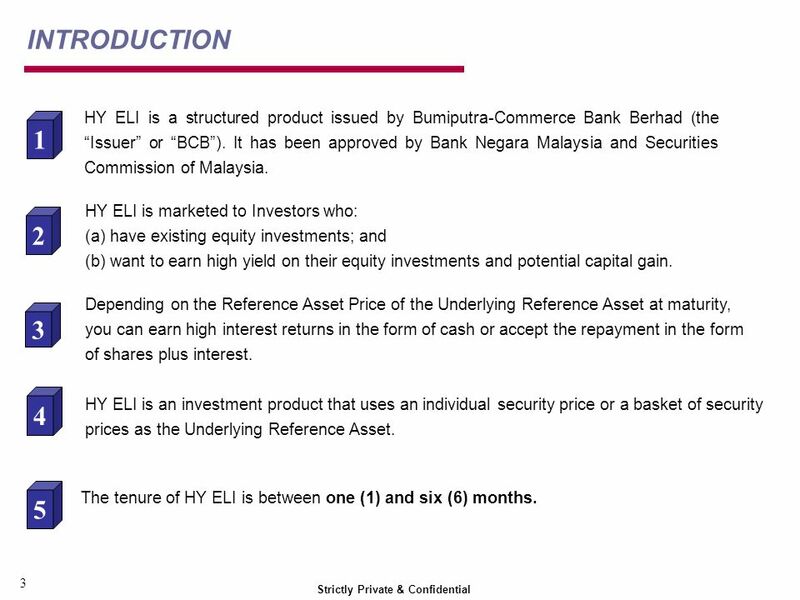 4 Strictly Private & Confidential INTRODUCTION HY ELI is a structured product issued by Bumiputra-Commerce Bank Berhad (the Issuer or BCB). It has been approved by Bank Negara Malaysia and Securities Commission of Malaysia. 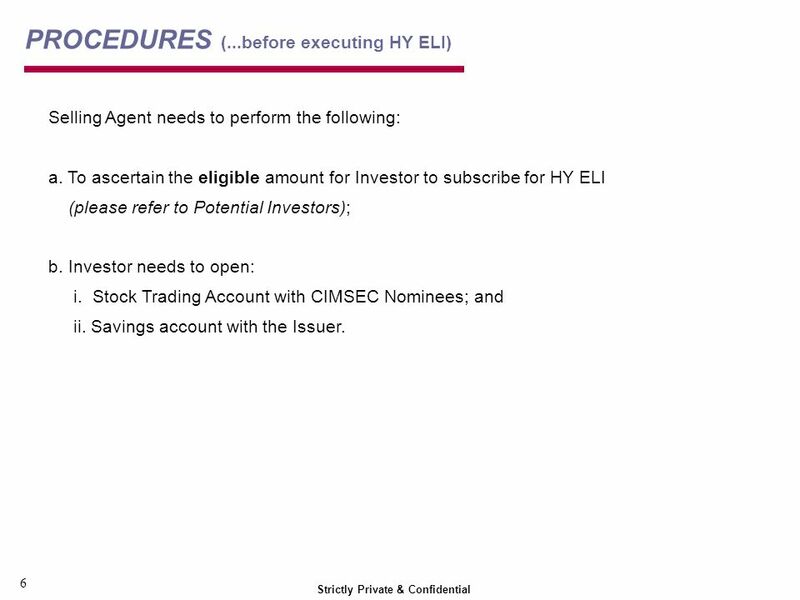 3 1 2 5 The tenure of HY ELI is between one (1) and six (6) months. 4 HY ELI is an investment product that uses an individual security price or a basket of security prices as the Underlying Reference Asset. 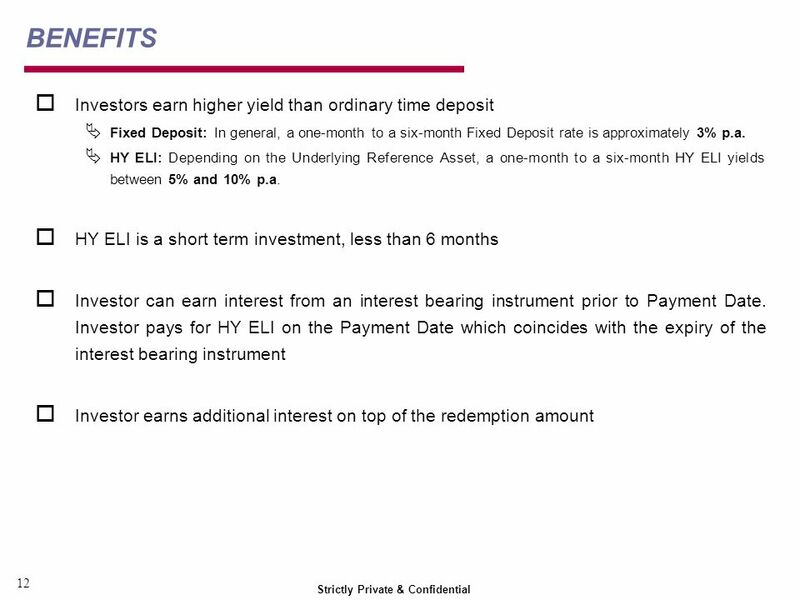 HY ELI is marketed to Investors who: (a) have existing equity investments; and (b) want to earn high yield on their equity investments and potential capital gain. 3 Depending on the Reference Asset Price of the Underlying Reference Asset at maturity, you can earn high interest returns in the form of cash or accept the repayment in the form of shares plus interest. 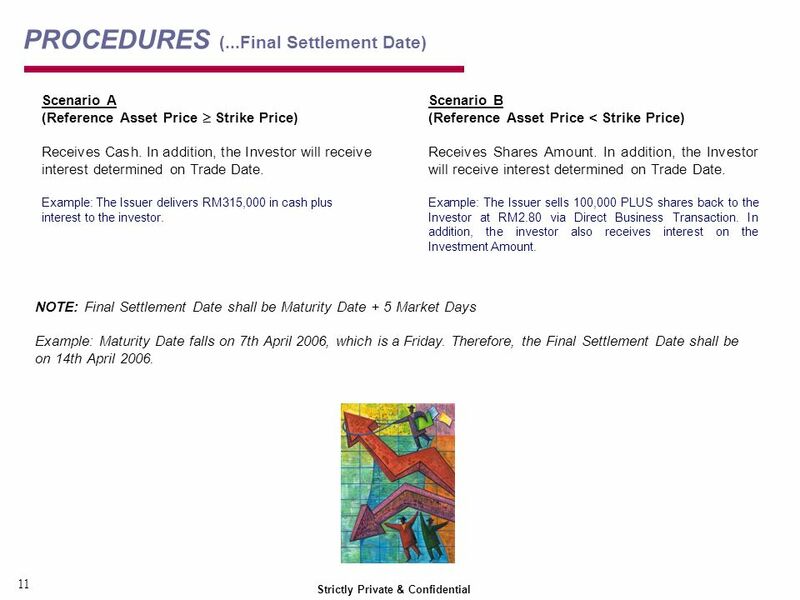 11 Strictly Private & Confidential PROCEDURES (...Maturity Date) SCENARIO A Reference Asset Price Strike Price If the Reference Asset Price of the Underlying Reference Asset determined on Maturity Date of HY ELI is EQUIVALENT TO or ABOVE the Strike Price, the investor shall receive the redemption amount in cash i.e. Shares Amount multiplied by the Strike Price. In addition, the investor will receive interest on the Investment Amount of HY ELI. 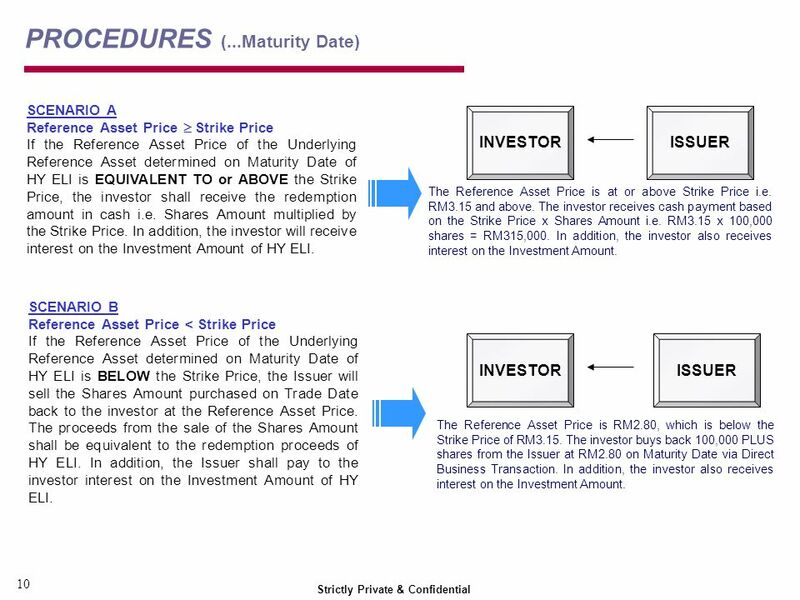 SCENARIO B Reference Asset Price < Strike Price If the Reference Asset Price of the Underlying Reference Asset determined on Maturity Date of HY ELI is BELOW the Strike Price, the Issuer will sell the Shares Amount purchased on Trade Date back to the investor at the Reference Asset Price. 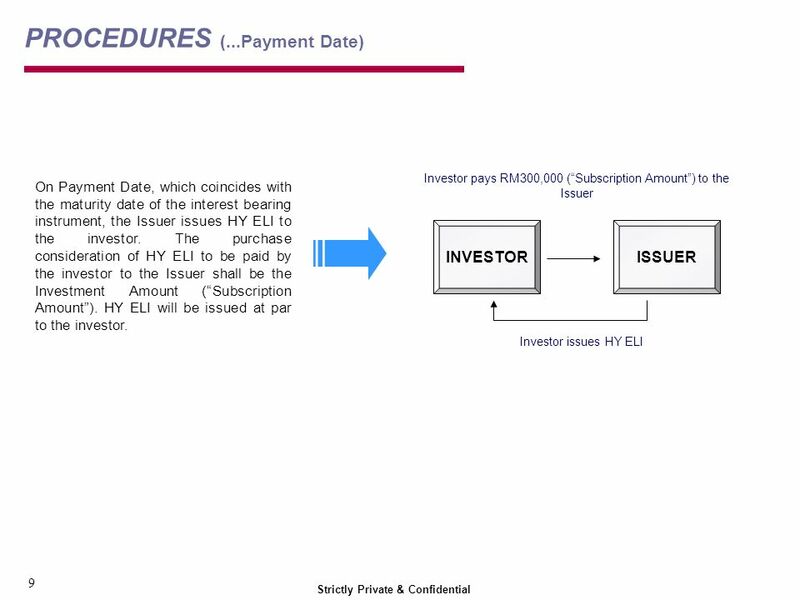 The proceeds from the sale of the Shares Amount shall be equivalent to the redemption proceeds of HY ELI. 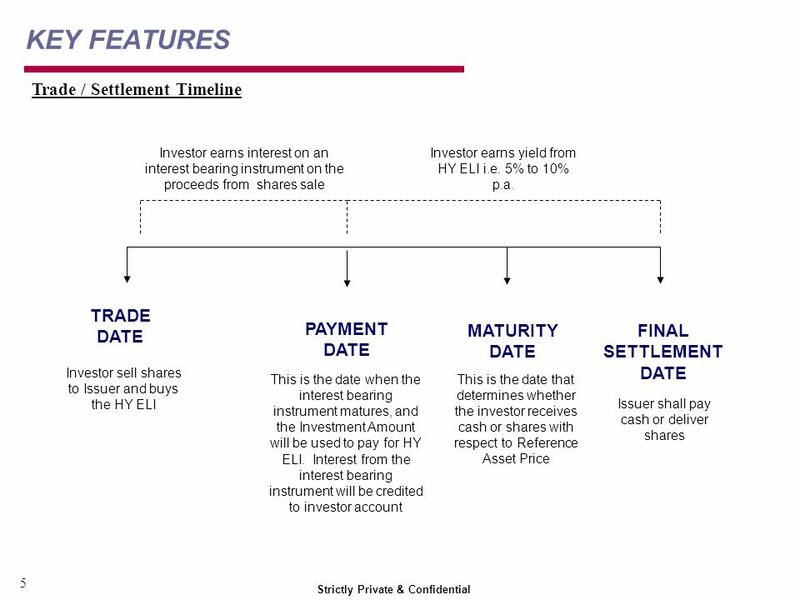 In addition, the Issuer shall pay to the investor interest on the Investment Amount of HY ELI. 10 INVESTORISSUERINVESTORISSUER The Reference Asset Price is at or above Strike Price i.e. RM3.15 and above. 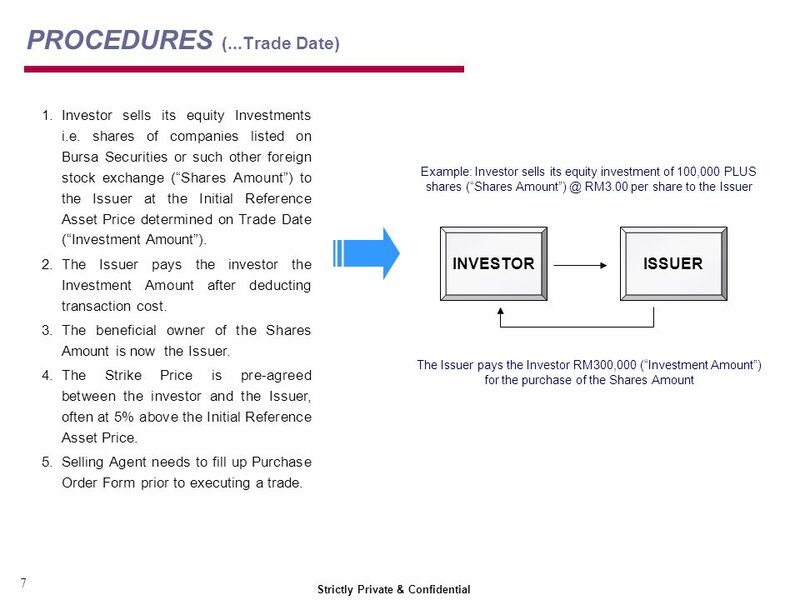 The investor receives cash payment based on the Strike Price x Shares Amount i.e. 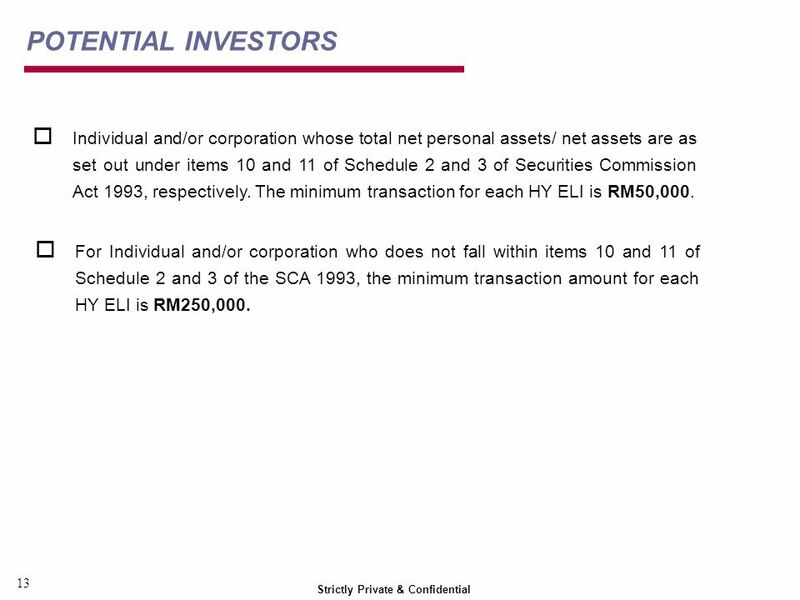 RM3.15 x 100,000 shares = RM315,000. In addition, the investor also receives interest on the Investment Amount. The Reference Asset Price is RM2.80, which is below the Strike Price of RM3.15. 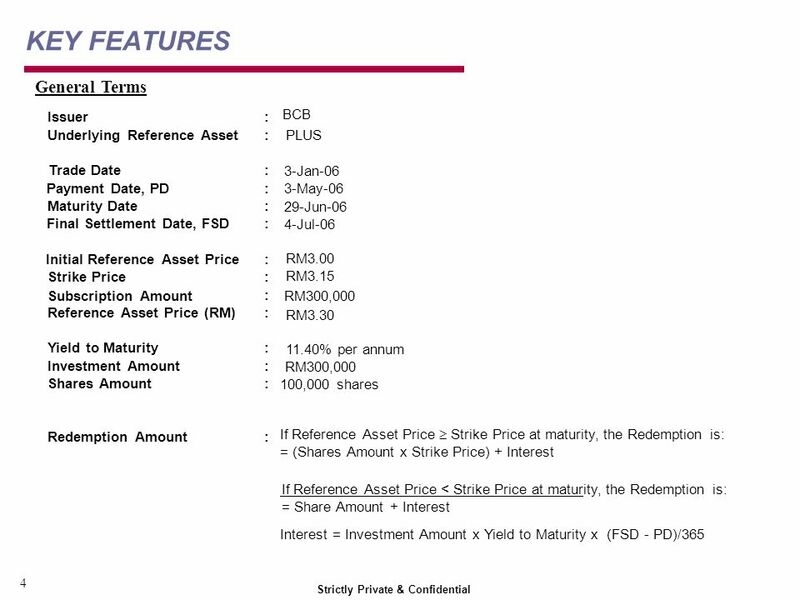 The investor buys back 100,000 PLUS shares from the Issuer at RM2.80 on Maturity Date via Direct Business Transaction. In addition, the investor also receives interest on the Investment Amount. 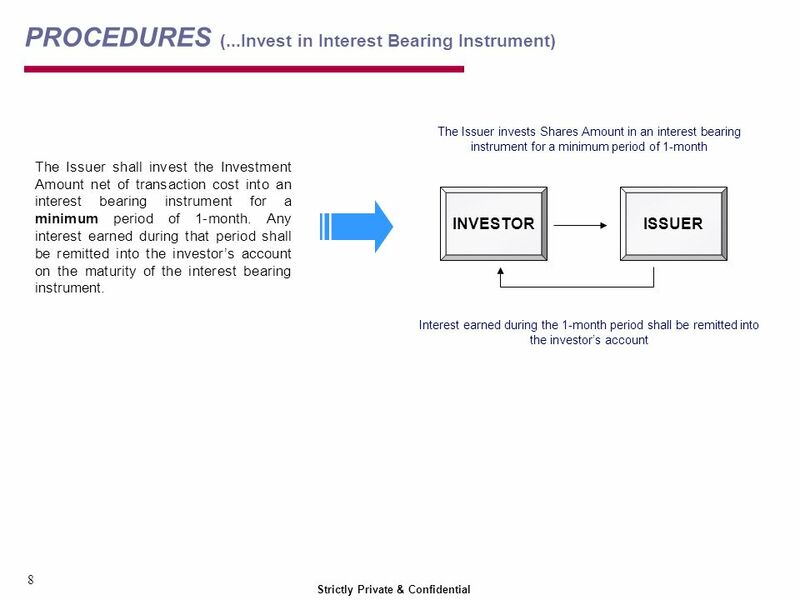 17 Strictly Private & Confidential IMPORTANT NOTICE 16 This presentation has been prepared by Commerce International Merchant Bankers Berhad (CIMB) exclusively for the benefit and internal use of investor in order to indicate, on a preliminary basis, the feasibility of possible transactions. Terms contained in this presentation are intended for discussion purposes only and are subject to a definitive agreement. All information contained in this presentation belongs to CIMB and may not be copied, distributed or otherwise disseminated in whole or in part without the written consent of CIMB. This presentation has been prepared on the basis of information that is believed to be correct at the time the presentation was prepared, but that may not have been independently verified. makes no express or implied warranty as to the accuracy or completeness of any such information. 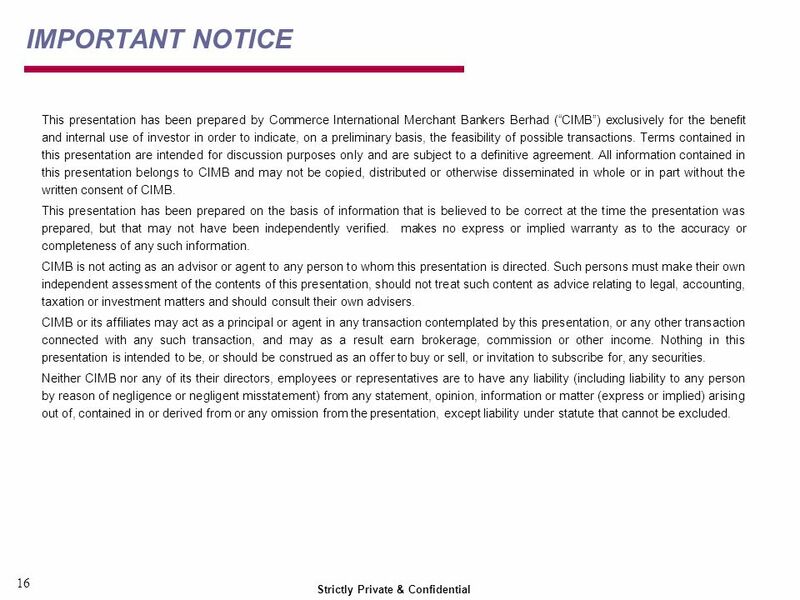 CIMB is not acting as an advisor or agent to any person to whom this presentation is directed. Such persons must make their own independent assessment of the contents of this presentation, should not treat such content as advice relating to legal, accounting, taxation or investment matters and should consult their own advisers. 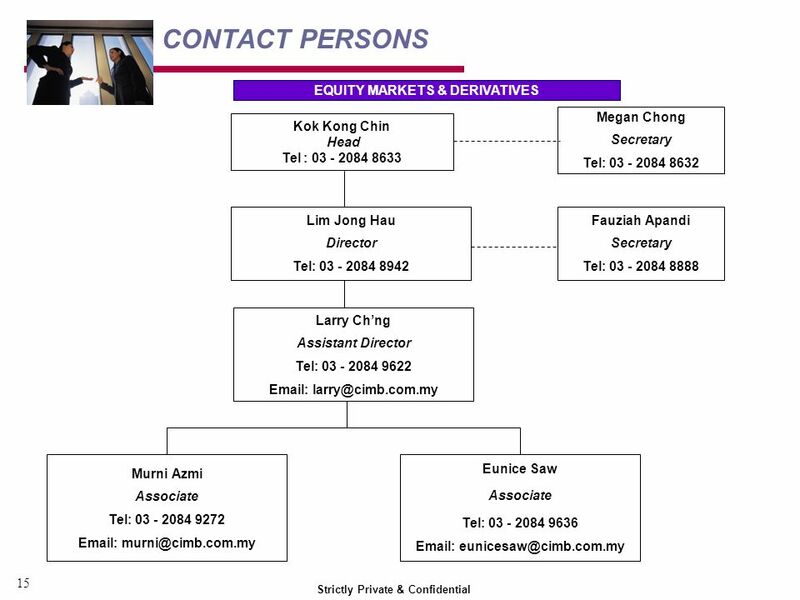 CIMB or its affiliates may act as a principal or agent in any transaction contemplated by this presentation, or any other transaction connected with any such transaction, and may as a result earn brokerage, commission or other income. 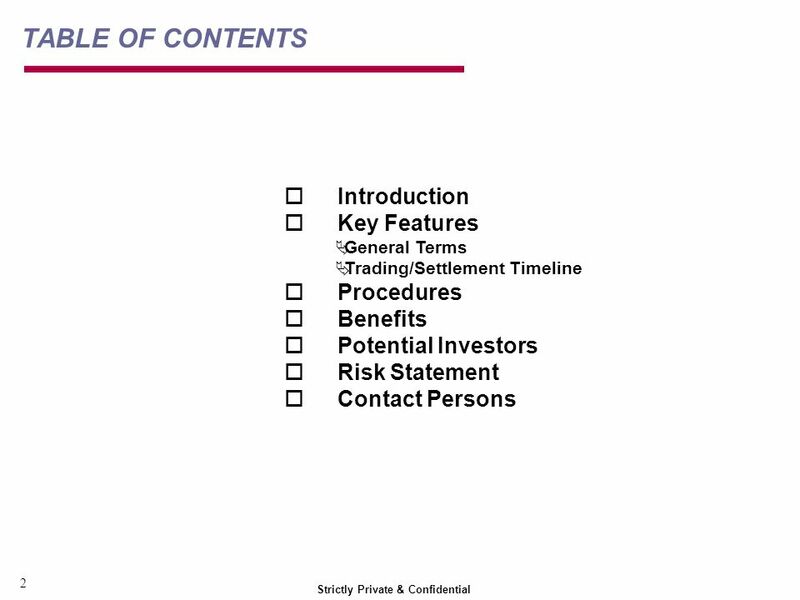 Nothing in this presentation is intended to be, or should be construed as an offer to buy or sell, or invitation to subscribe for, any securities. Neither CIMB nor any of its their directors, employees or representatives are to have any liability (including liability to any person by reason of negligence or negligent misstatement) from any statement, opinion, information or matter (express or implied) arising out of, contained in or derived from or any omission from the presentation, except liability under statute that cannot be excluded. 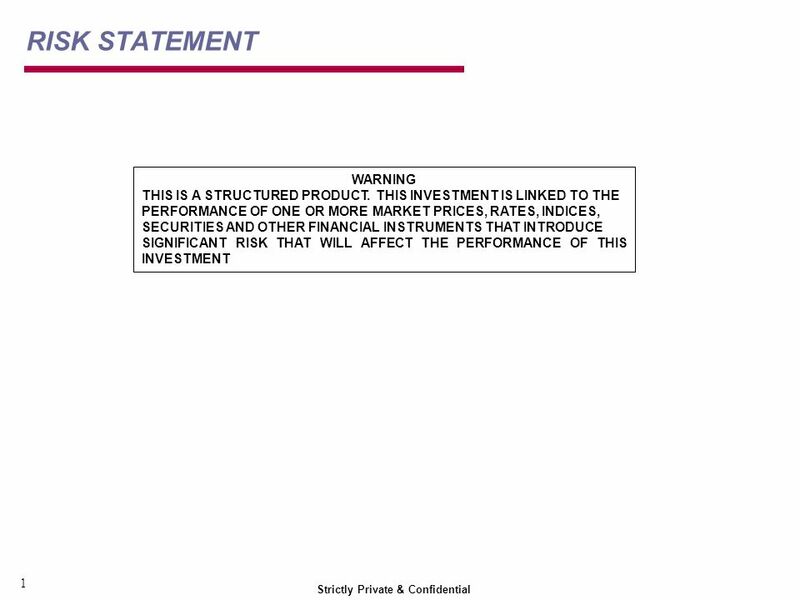 Download ppt "Strictly Private & Confidential HIGH YIELD EQUITY-LINKED INVESTMENT (HY ELI) Grow Your Investments for Higher Returns Arranger Calculation Agent Manager." Avancee Research TM What matters other than Quality? ©Avancee Research Outsourcing Private Limited Sample Content Project on Market Capitalization & Enterprise. Investme nt. What is Investment? Money you earn is partly spent and the rest saved for meeting futures expenses. Part 6 Financing the Enterprise © 2015 McGraw-Hill Education. Futuro Forum | Bowral 2012 Realm Investment – Fixed Interest. Chapter # 4 Instruments traded on Financial Markets. Characteristics of Taxable Securities Money Market Investments Highly liquid instruments which mature within one year that are issued by governments and.